So cute! 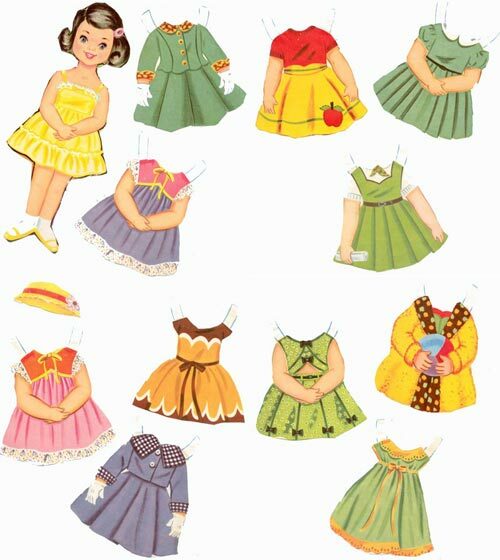 This 1950s (or early 60s) vintage paper doll set has so many options for this rosy-cheeked darling. There's tailored coats, full-skirted vintage girl's dresses, school girl frocks and even sun & swimwear. No matter what she wears, she's always pretty in her bright yellow petticoat underneath. We just love vintage paper dolls, but I don't know a lot about them. If you happen to know the name of this little charmer, please let me know! I used to play paper dolls when I was in my elementary days. It was really fun. And I do have lots of dresses since those paper dresses aren’t so expensive back then.